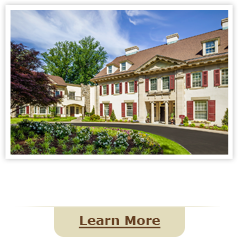 We hope our answers to FAQs provide information you need about personalized and distinctive Assisted Living and Memory Care in historic Main Line Philadelphia. As an Assisted Living community, the Hearth offers an all-inclusive predictable monthly rate that doesn’t increase even if or when needs do. The Hearth is a rental community and as such there is no large up-front investment or entrance fee. For permanent residents, there is a one-time community fee of $3000 upon move-in. I am still independent. Is the Hearth for me? The Hearth has three levels of progressive assistance. These levels are designed for residents who are living independently now, those residents who need assistance with activities of daily living all the way up to a more intensive level of care. Additionally, The Hearth’s Inspiring Today memory support program provides for the needs specific to our residents with memory impairment. What types of amenities and activities are available for me at The Hearth? The Hearth offers a wide range of amenities and activities to our residents. Weekly housekeeping with linen service, personal laundry and delicious meals are just the beginning. We offer a full calendar of activities and outings, including (but not limited to!) our Poetry Club, History talks, trips to the Bryn Mawr Film Institute and local restaurants. We also have a special relationship with the Aquatic Fitness Club in Bala Cynwyd for those who want to hit the pool or take in a fitness class. What if my health needs change? The Hearth is designed as an “aging in place” community. Even as a resident’s needs change, we provide the necessary supportive services, without the need to move residents elsewhere to receive care. Furthermore, this support is provided at a predictable monthly rate that doesn’t increase even if needs do. At The Hearth, we know that our residents have lived extraordinary lives and that shouldn’t change because they need support. Our residents continue to live by their own lifelong routines with our support. Life on the household is driven by resident choice not by staff schedules. We build relationships with our residents learning their preference and allowing them to direct us in their care. At The Hearth at Drexel we recognize that your pets are family. Please contact us to discuss moving in to our pet-friendly community.